What better way to visually express the beauty of Anja McCloskey‘s exquisite vocals and accordion based folk music than through interpretive dance, right? And better yet, how about a setting that is reminiscent of any one of the Twilight movies, but make it far more interesting and relevant (to anything really). Then throw in some random blood-smeared faces. And while the situation is obviously a bit dark and partially morbid, the obvious beauty of Anja’s voice can not be masked. 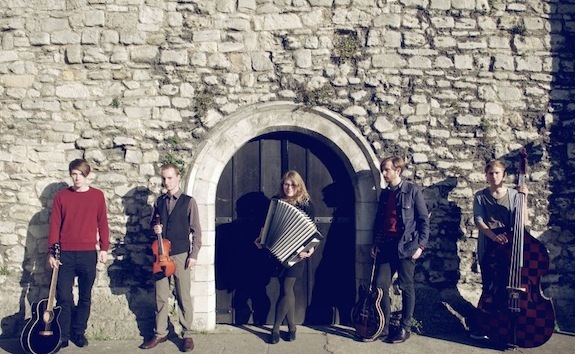 McCloskey’s enticing accordion playing is only slightly obscured by that wonderful set of vocal chords she displays. “And Her Head” is about as perfect of a single as we can hope to hear from such an inspiring songstress. Although she has never failed to create a perfectly intriguing song, we find our heroine at her very best and this dark and lovely tune. She comes off as ripe as the peach, and as enticing as we could ever hope for on her latest single. Improving upon this magnificent track may be tough, but surely if anyone can do it, Anja McCloskey most definitely will.